Rubra Flore Plena Tenuifolia (meaning red, double-flowered fernleaf) is the big name for one of the smaller—but most fascinating—peonies that can be found in gardens throughout the world. 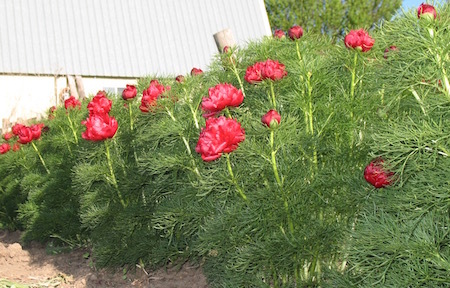 It makes our Top 10 List because of its finely-dissected, soft foliage set off by bright crimson blooms that open very early among all the peony cultivars. In fact the delicate leaves and tiny buds often can be seen emerging through the last of the winter snow. Rubra Flore Plena is just one of the cultivars derived from the species tenuifolia, which still can be found in the wild on the steppes of Crimea, the Ukraine and the Caucasus. Other varieties feature single form flowers in red, pink and white. All are short in stature, ranging from about 1 foot in height up to about 20 inches, depending on where its growing. They are super hardy. Here in Northwest Wisconsin, the fernleafs have no problems with winters that can dip to minus 50 degrees F. Another feature they have in common is their tendency to go dormant in the heat of summer. The foliage then turns brown and can be removed at that time. Savvy gardeners often plant their fernleafs behind late emerging perennials or annuals to conceal the bare spot. They also know to cut back on watering these plants at this stage, because it can lead to root rot. Tenuifolia also have a very different root structure than other peonies, making them more difficult to propagate. That's why root divisions often are smaller in size and may have fewer eyes or buds, but command a higher price than many other more common varieties. The blooms are small—about 2-3 inches across—and come one per stem. But the waxy quality of the petals make the brilliant red flowers shine in the sunlight, drawing the attention of any who wander through the garden. 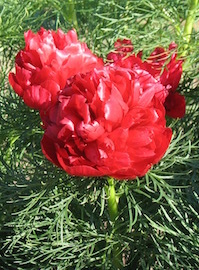 It's one of the reasons Rubra Flore Plena Tenuifolia is our best selling peony. Do you grow this peony? If so, please share your experiences.